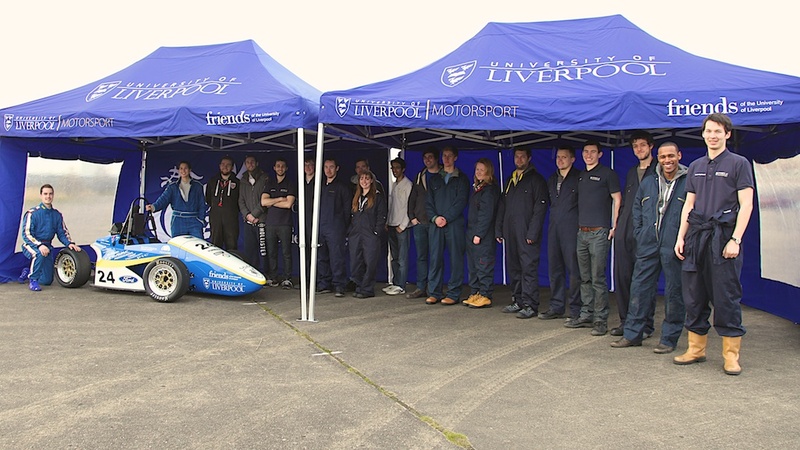 The Formula Student competition in Győr, Hungary marks the final competition event of the University of Liverpool Motorsport team's summer season. This is the first year that the team has competed at this event, and is likely to be a permanent addition to the team's calendar. ULM joined Huddersfield and Swansea to represent Great Britain alongside teams from Germany, Russia, Czech Republic, Greece, and a number of other European countries. The competition celebrated its fifth year in Győr, one of Hungary's most established and developed Industrial areas, well known as the 'Gateway to the West'. 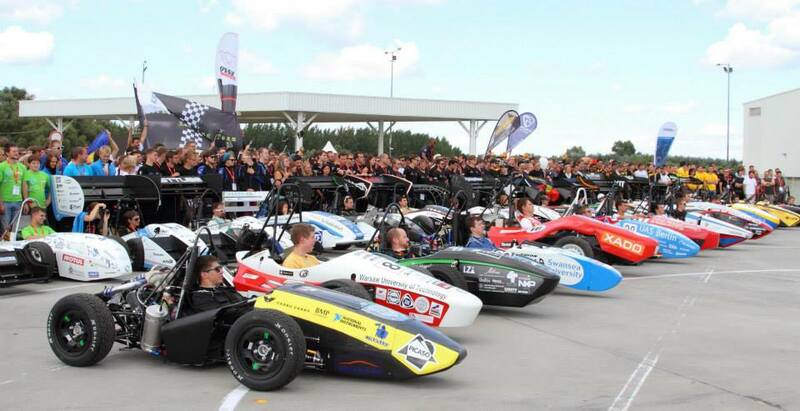 The Széchenyi István University links the local and international industry in the area with the Formula Student competition, with major sponsors including Audi, Continental and National Instruments. 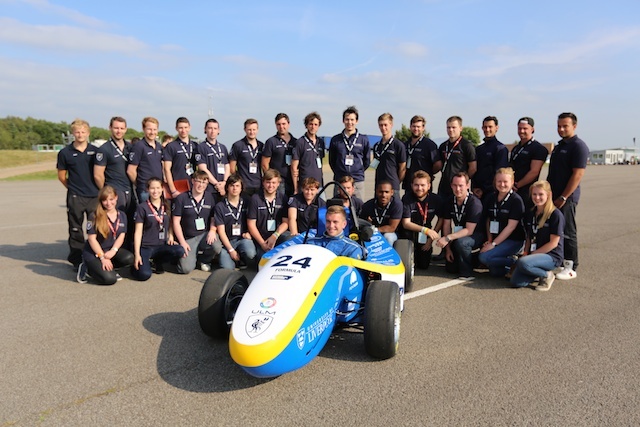 The team progressed without any problems through the scrutineering-based events, and enjoyed a strong display in the Business, Cost and Design events. The results posted on the Saturday revealed a top 3 finish in the Cost event and a final 5 position in the Business Logic event, keeping spirits high during a day which was plagued with heavy rain. 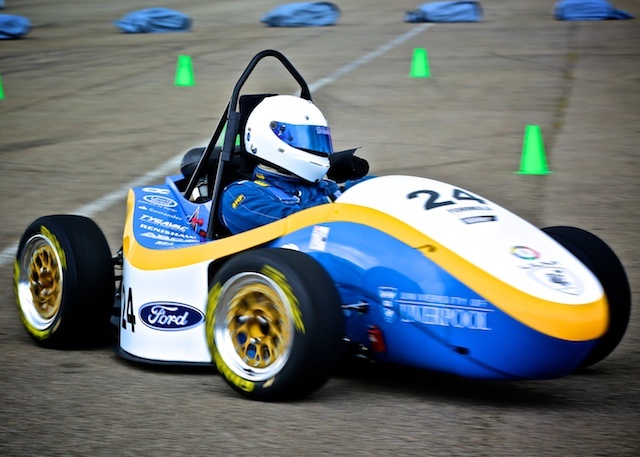 The Acceleration, Skid Pad and Autocross events were successfully completed, followed by a Business presentation final in the evening to determine the concluding standings. 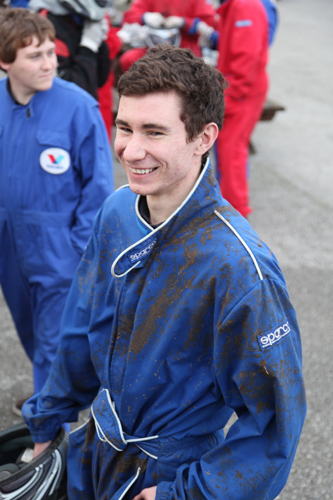 Following the performance in the Autocross in which Liverpool posted the fastest time of the three British teams, the endurance event began with a strong start, with driver Sean Crockwell posting consistent times. However, with one lap to go before the driver changeover, an electrical failure caused the car to retire from the event; an unfortunate end to the team's otherwise highly successful weekend. Yesterday the team spent another day putting ULM009 through its paces at the Bruntingthorpe test track. The day provided each of the teams drivers with a significant number of laps in the car, and allowed for testing the new wings and dry sump. The car successfully withstood the equivalent of a full competition endurance event, with the drivers pushing to find the cars true limits. The experience gained by the drivers ensures a greater level of confidence in the car, and will allow the team to be more competitive in the dynamic events. 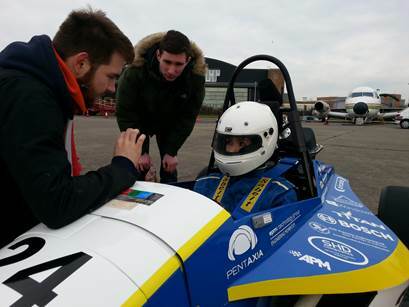 Testing throughout the year is an essential part of a Formula Student teams development, and the success of this test day aims to set a precident for next years fourth years. 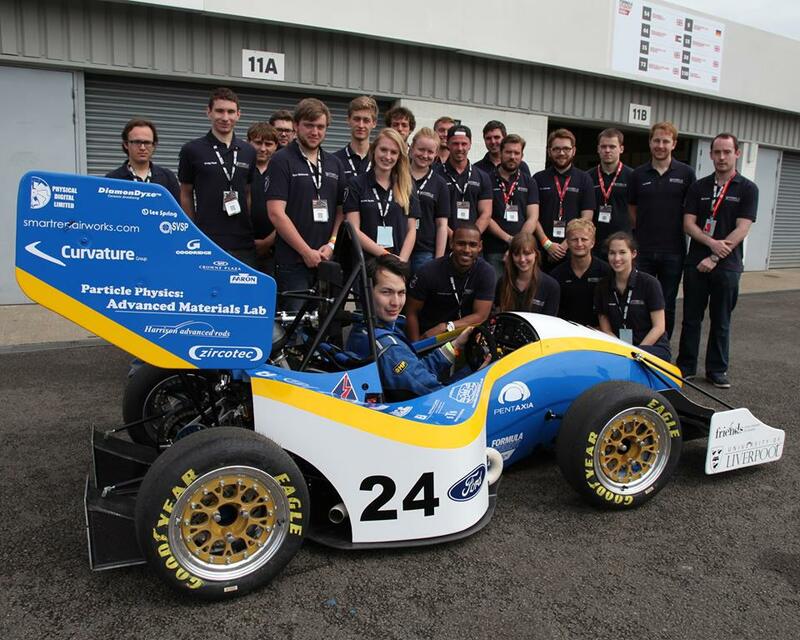 On Thursday 10th of July, the University of Liverpool Motorsport team took their pride and joy, ULM009 to FSUK 2014. 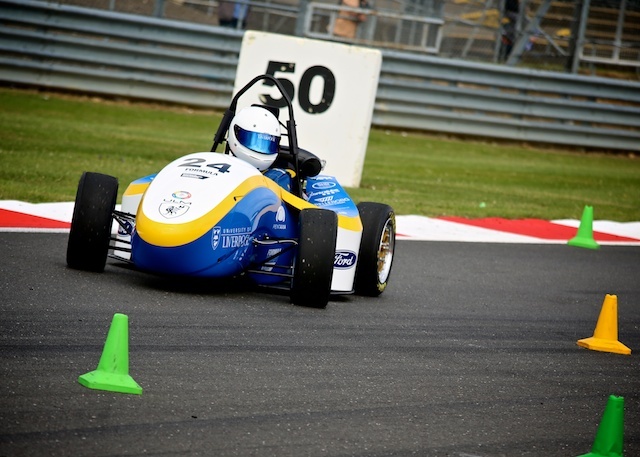 The event at Silverstone brings together universities from around the world; overcoming language barriers and culture differences through a shared passion for motorsport. The team are very proud of ULM009 and would like to extend their gratitude to all those who have helped to bring the car to reality. First of all, ULM Racing would like to thank Virtalis and VEC for providing equipment, skills and inevitably the means to host what could be seen to be one of the most impressive pit boxes at competition. 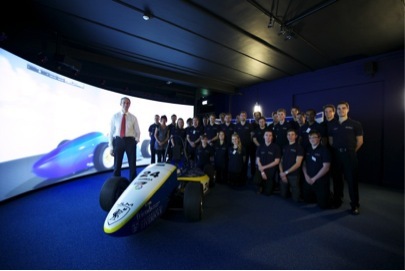 The Virtalis virtual engineering display continually turned heads and allowed the design team a unique way of presenting the car, using interactive 3D imaging technology. The Business Team (Serena Yeats, Jay Conlon & Tom Wolfe) clearly impressed the judges, scoring 2nd overall in the event. The cost and sustainability team secured 22nd place, whilst the design team scored 20th in explaining the critical design changes for the ULM009 model. From Friday, the dynamic events could proceed, and the car was quickly passed through the rigourous scrutineering process. It subsequently breezed through the noise, brake, tilt and chassis tests. Weighing in at 224kg and turning heads at every stage, the car was in a very good position to becoming ULM's most impressive vehicle yet. 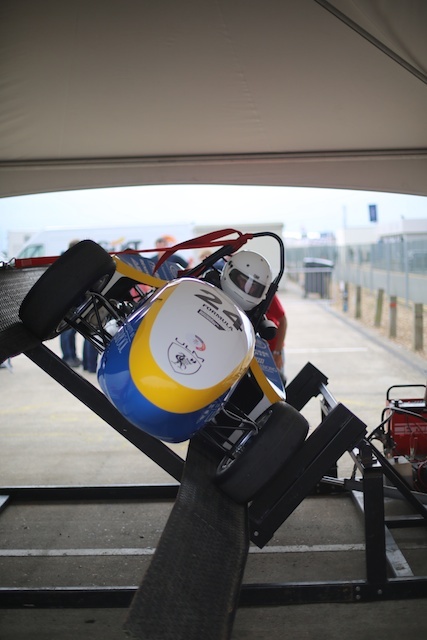 Unfortunately, disaster struck when the team experienced a critical component failure; leaving ULM009 unfit to compete in Saturday's acceleration, skid pad and sprint events. The team pulled together and found a solution allowing ULM009 to complete the endurance event on the Sunday. Driven by Tom Jakeman and Sam Whitworth, the vehicle comfortably finished the 22km circuit, to huge support provided by team members watching from the stands. Despite the setback during the early dynamic events, the admirable performance of the team and its finished product ULM009 is testament to the continued efforts of everyone involved in the project, from the sponsors, to the staff and the students themselves. 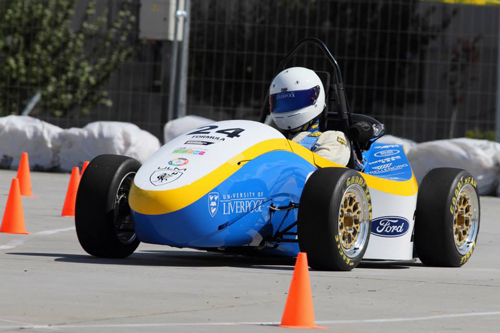 The team is now looking toward competition at Formula Student Hungary 2014 on August 21-24, where they will look to improve their performance with a tuned and tested ULM009 car. The radiator for ULM009 has been provided by Aaron Radiators. The custom unit is tailored to the Yamaha R6 engine and is a dual-pass system, providing improved cooling to the engine components. 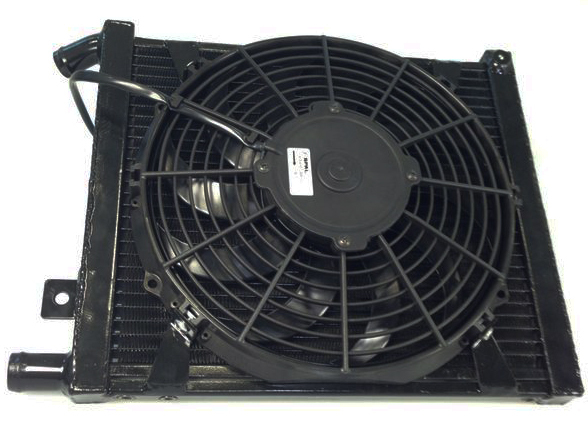 The radiator is assisted by a large fan unit, provided by Spal Automotive. 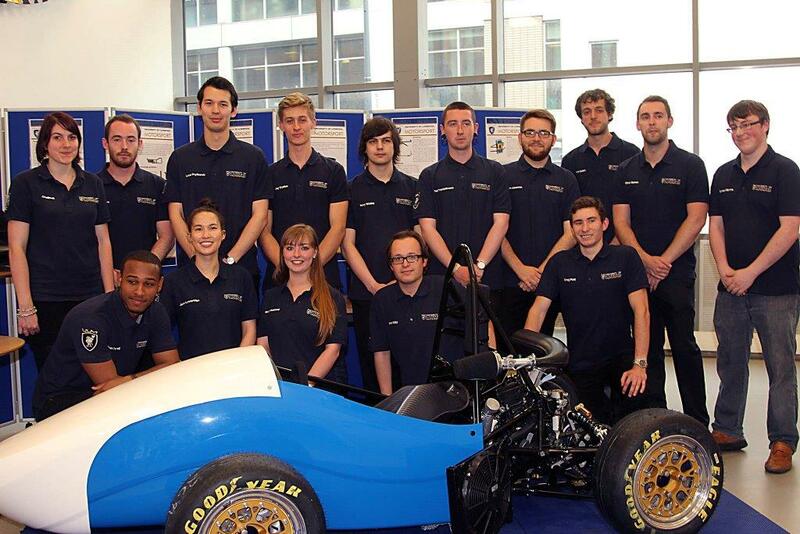 The University of Liverpool Motorsport team have unveiled their competition car for the 2014 season, ULM009. This happened during a launch night attended by sponsors, alumni and members of the team. The night consisted of a general meet-and-greet and a number of other attractions, including a driving simulator and a 3D CAD model provided by sponsors Virtalis. The launch went extremely well, with attendees delighted to see how the build has progressed and the new additions featured on this years car, including a sneak peek at the first full aero package featured on a ULM car. ULM would like to thank all those who attended the launch night and the numerous sponsors invested in the team for their continued support to make this years car a reality. 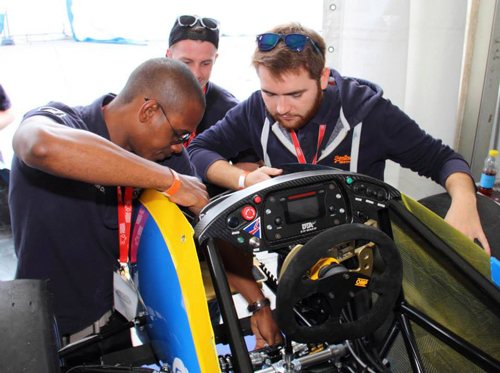 Sponsors of the ULM Formula Student Team can prove to be invaluable in the accumulation of knowledge, skills and expertise whilst running a fully-fleged race team. Many thanks go to James Tatnell and Cosworth for welding various aluminium components during the final push towards the ULM009 launch night, including the firewall, fuel tank and cooling pipes. Many of these components lie on the car build's critical path and Cosworth's ability to cope with the short lead time required helped greatly. Cosworth have generously aided the team in many different areas, developing a new partnership and ensuring ULM009 will be a great success. Tygavac kindly invited ULM Racing to attend the opening of their new 126,000 square foot factory in Oldham on Monday 16th June. The 6 acre site, with dedicated areas for each section of the manufacturing chain will allow further expansion in the future. ULM Racing proudly displayed their ULM008 vehicle in front of key industry members including current sponsors Pentaxia and EPM, along with the Mayor of Oldham, Councillor Fida Hussain and his wife, Mayoress Tanvir Hussain. ULM Racing would like to extend their gratitude to Tygavac for their continued support and the use of their new autoclave and to thank Nick Evans for his help on the day. Peter Cox Ltd have kindly provided the team with a generous financial donation to cover crucial parts in the lead-up to the summer events. On top of this, they are also using their extensive connections to help organise transport for our trip to Hungary this summer. In the countdown to competition, Cosworth assisted the team to integrate a more advanced engine management system into the current car. Cosworth generously provided the Pectel SQ6 Engine Control Unit (ECU). 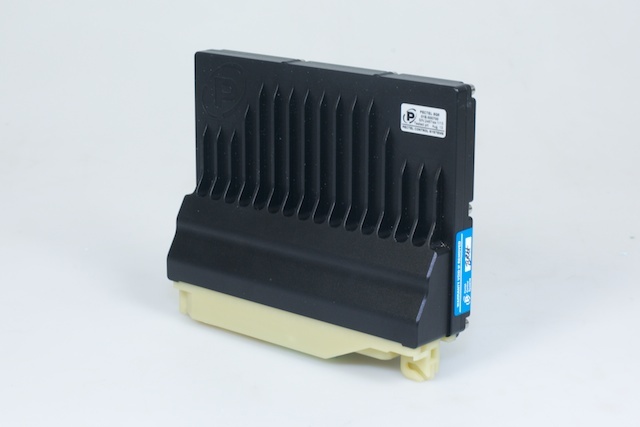 This new ECU will improve engine management and data retrieval capabilities. As this unit is more advanced than the previous ECU, Cosworth kindly supported the team in integrating this new unit into ULM009. The previous car, along with the new ECU, and selected team members visited Cosworth Electronics in Cambridge on 2nd and 3rd June. 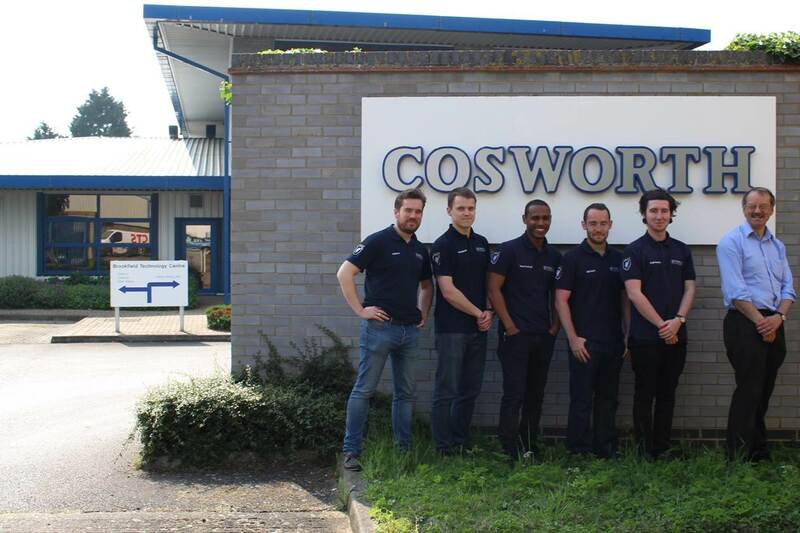 While at Cosworth, the team had the pleasure of meeting Adam Covell, Derek Morley, Lawrence Riley, and Clement Ailloud. On the first day, Clement began by giving a brief tutorial of the software used to configure the Pectel ECU. The next stop was the garage, where the Pectel ECU would be configured. The configuration process began with experimenting with different fuel maps and calibrating the throttle and crank position sensors. The next day Lawrence, a Track Support Engineer, gave further assistance. In this session, more assistance was given towards calibrating the sensors. During this process we became more familiar with the software. Lawrence also gave some advice on how to install and configure Lambda, wheel speed sensors, and other engine management devices. Successful integration of these systems is great news for the team as this a leap forward into a new partnership with Cosworth and greater engine management. As the countdown to competition continues, the electronics and data acquisition team is working tirelessly to ensure that this new advanced ECU is utilised as much as possible on ULM009. Anodisers Runcorn have again generously provided anodising services for the team. Besides providing protection, the anodised wheel centres, stub hubs and dry sump now gives the team its characteristic colours. 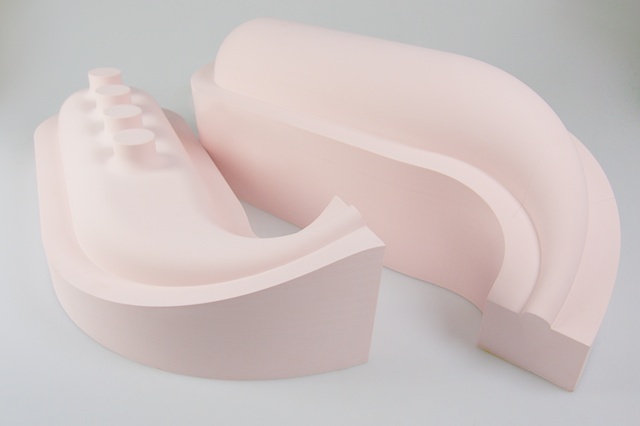 Marbocote have generously donated a selection of composite mould preparation products, which will allow for the manufacture of ULM009's carbon fibre parts. 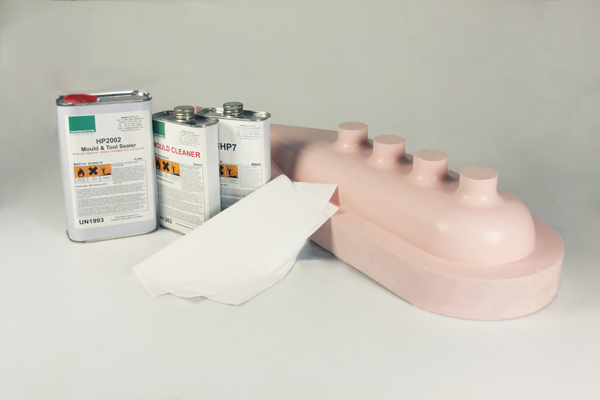 The porous epoxy moulds used must be thoroughly cleaned and prepared using specialised cleaner, sealant and release agents, to ensure a high quality part finish is achieved. Without these supplies provided by Marbocote, this arduous task would also be an expensive one, potentially also yielding much lower quality parts. The team look forward to working along with Marbocote in the future, as high-tech composite materials continue to be an increasingly important part of the car's design. Even through the rigmarole of exams, team members are still tirelessly working on Formula Student with just eight weeks to go before competition. ULM009's brand new CFC intake assembly successfully ran on the ULM008 car in the rolling road, withstanding the mechanical stresses imposed by the engine. The new lightweight design saves over 1kg compared to the previous ABS plenum and the inlet is directed to the side of the car for a cleaner intake of air. This is a major performance improvement as the team is utilising the more advanced materials and manufacturing methods that have become available in recent years. The team would like to thank all supporters and sponsors of the team, including Pentaxia, Gurit and Marbocote, who have generously supplied the parts for the plenum. Premier Deep Hole Drilling Ltd. have generously gifted the team with the gun-drilled blanks to ensure this years car has strong, but relatively lightweight driveshafts. 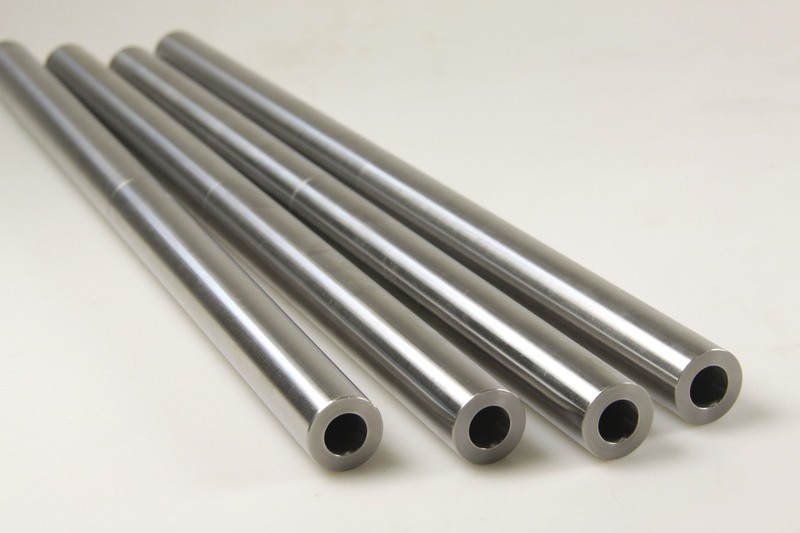 These hollow driveshafts offer a significant weight advantage over the solid alternatives used on previous ULM cars, and Premier Drilling have kindly provided parts to cover both ULM009 and ULMX. Next years team will greatly benefit from this offering, which demonstrates the importance of strong sponsor partnerships. Many thanks go to Contralube for providing the team with a generous financial donation, in addition to supplying their Contralube 770 product. The state of the art synthetic gel is used on ULM009 to protect electronic data connections and contact areas. The car has many engine sensors and numerous components that are connected to the ECU. Contralube 770 will be applied to these connections to ensure there is no risk of corrosion, wear, dust, rust, or vibration damage. 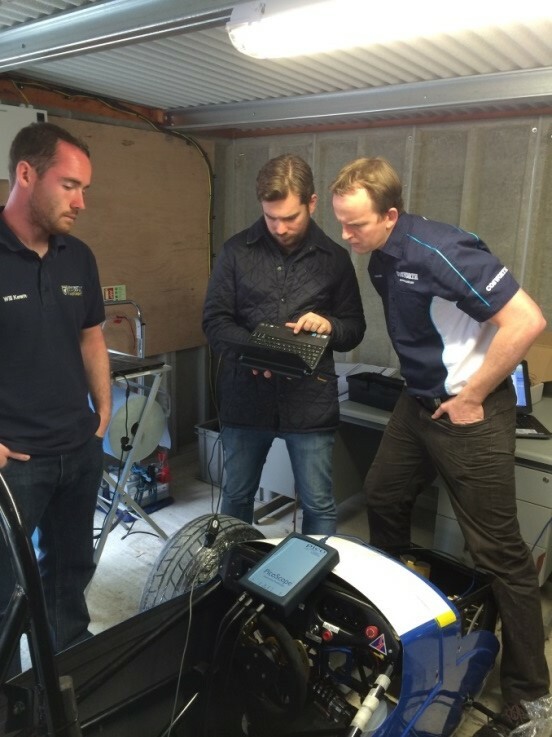 Several of the ULM team paid a visit to the Cranfield Impact Centre, to make use of their dynamic testing facilities used by Formula 1 racing teams and other high-profile clients. 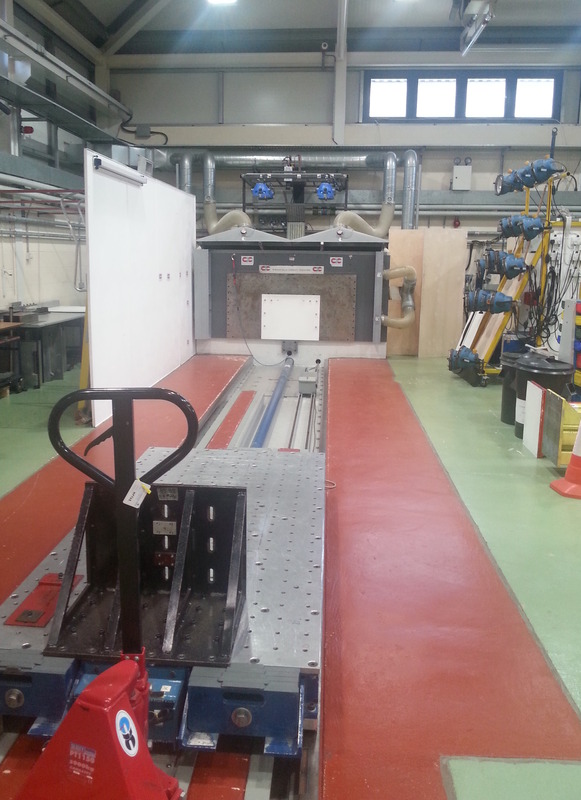 The impact sled enabled the team to monitor the crush behaviour of honeycomb board and carbon fibre composite impact attenuators, providing high-speed motion capture and sled deceleration curves. 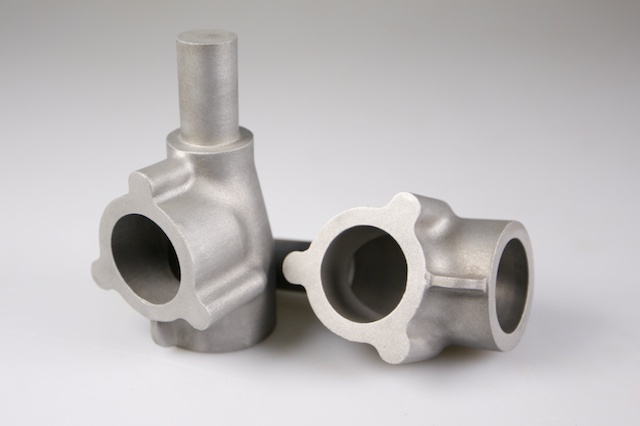 For the second time this season, Renishaw have assisted the team with their investment casting capabilities. In the space of three weeks, they were able to convert a CAD model into wax patterns and then cast it into aluminium parts. By providing the team with this service again, the team has been able to explore a bevel gear steering assembly with a bespoke casing, photographed below. All four uprights have been manufactured and delivered by STS Ltd in the short lead time of just three weeks. This process includes the machining, bead blasting and clear anodising for a perfect surface finish of our precision engineered components. 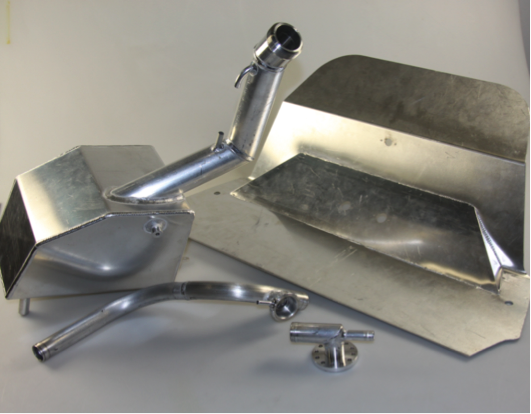 All four uprights are bespoke and accommodate outboard shimming brackets for fully configurable suspension. This has been a critical milestone towards finishing the ULM009 rolling chassis, which is scheduled for completion by the end of the month. 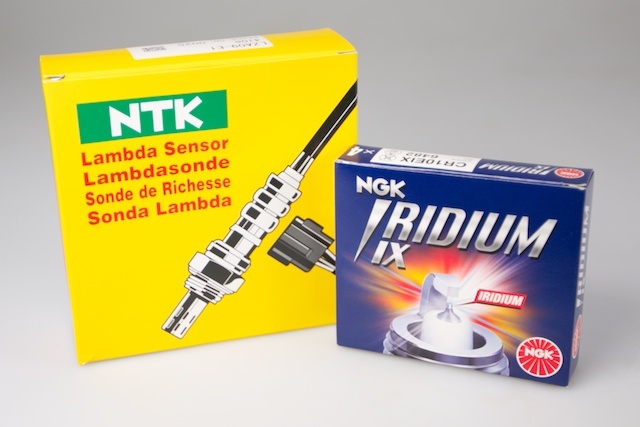 NGK Spark Plugs has generously provided the team with new spark plugs and a lambda sensor for the ULM009 car. Integrating the lambda sensor will allow the team to capitalise on the new ECU software and develop closed loop fuelling. This will improve the ULM009 engine performance as well as keep the car running fuel efficiently. 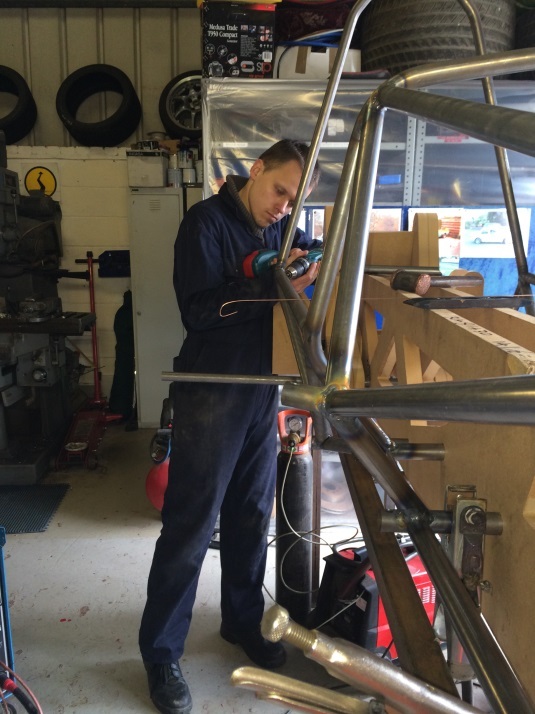 The team has been working tirelessly, alongside MDA-Motorsport, over the last couple of weeks to weld the steel space frame chassis. Members; Marius, Lucas and Jess, found themselves staying through all hours of the night to create the low-cost jigs for the entire chassis and engine integration. The chassis used two sets of MDF jigs; one for the main frame and one for the rear subframe. 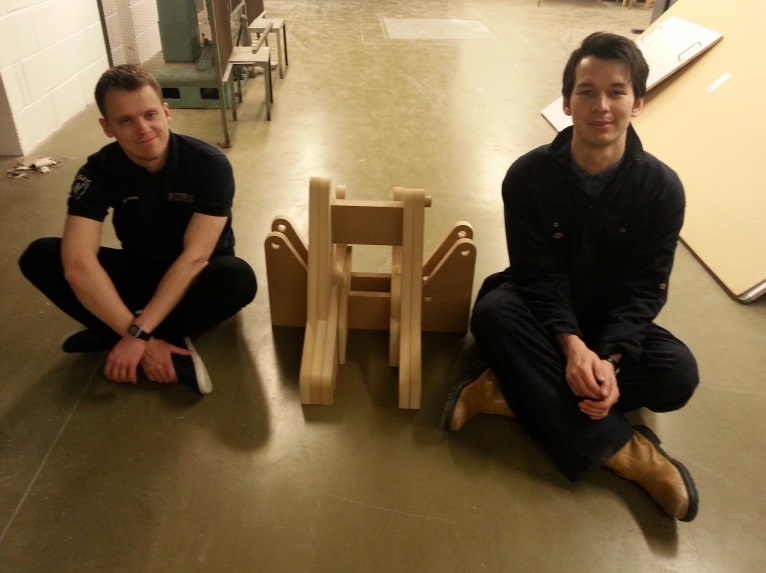 An exhausted pair, Lucas and Marius, can be seen below with their newly finished rear subframe jig. 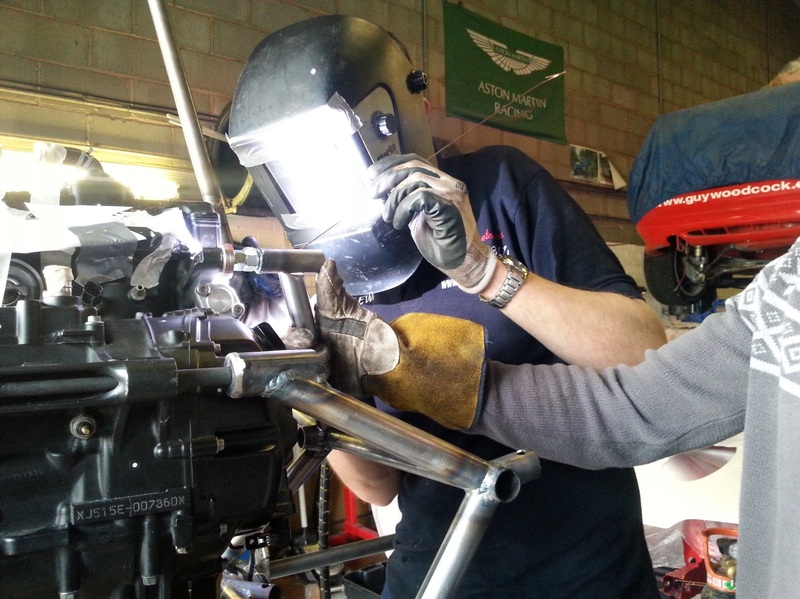 The team has spent two weekends of the welding phase with MDA-Motorsport, in Cheshire, assisting with the assembly of tube members and integration of the detachment methodology. The first weekend from the 22nd March involved the arranging and locating of the 100 components used within the frame to get tacked and welded throughout the week. 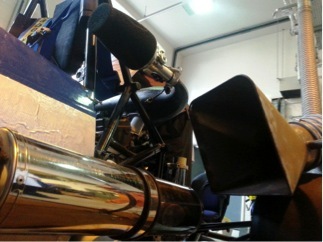 The following weekend was spent with the actual engine in situ during the final welds. This was also an opportunity to bring the next generation of ULM and give them a feel of what is to come. Photographed below are two junior team members, Serena Yeats and Jay Conlon, who are leading the business event together, and designing the undertray and cooling system, respectively. On a final note, we would like to thank Mathew Lewis, from MDA-Motorsport, for his time and services that he has contributed to the team. It is only with the generosity of sponsors and supporters as dedicated as this that the project is able to succeed as well as it does. Thanks to detailed engine CAD provided by Physical Digital LTD the team has been able to custom design their own dry sump; a new challenge previously unattempted by ULM. The dry sump allows improved oil management, prevents oil starvation and allows for more competitive engine positioning in the car. Thanks to Physical Digital's advanced scanning technologies, a CAD representation of the team's engine has allowed for cooling pipes, sensors, the new dry sump and a variety of other interacting parts to be accurately modelled. 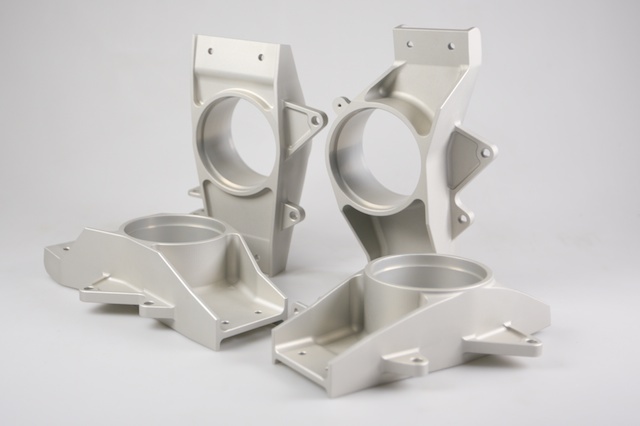 More reliable reference points ensure that items produced in the CAD environment will fit correctly when manufactured. This will prove extremely useful in the foreseeable future, and the team are hugely grateful for the advantages brought about by Physical Digital's contribution. The team are thrilled to receive the first set of 5-axis machined moulds from generous sponsors Pentaxia. ULM009 aims to feature the team's first full composite plenum chamber, and having the moulds in hand early is essential for testing. Experimentation with different reinforcement methods and carbon-fibre plies will be possible on test days, using the ULM008 car. 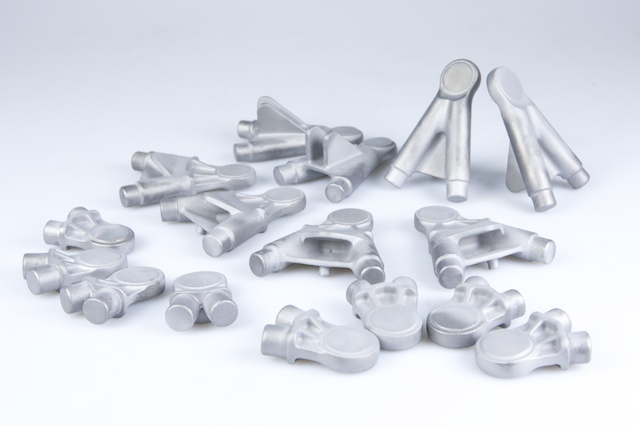 For the sixth year running, Tritech have been able to provide the team with top quality investment cast parts. Here are the wishbone ends for the ULM009 suspension, in great condition, and ready for post-processing. A test day this weekend enabled the team to get some vital driver experience before FSUK 2014 and provided senior team members with a much deserved test run of the ULM008 car. Six members took the car for a spin, including Sponsorship Manager Jess, photographed below. This was also an opportunity to utilise a grant that was gifted late in 2013 by the Friends of the University of Liverpool. The team was able to log G-force, GPS and performance data using newly purchased software, and to monitor essential temperature data from new on-board data acquisition equipment. Furthermore, the team was able to shelter from the weather conditions under the heavy-duty branded gazebos that were also purchased with the budget. 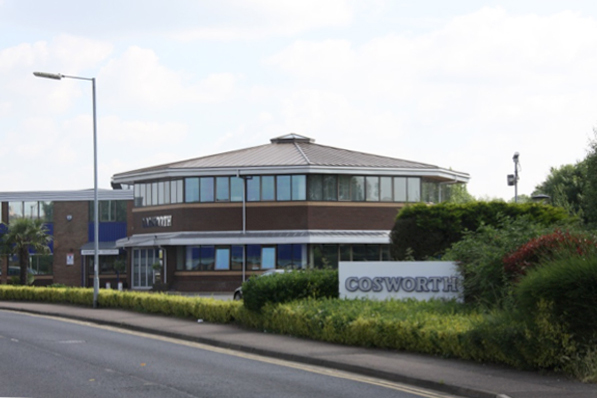 The team would like to thank Cosworth for becoming the team's newest sponsor. They have provided the hardware, software and technical support for the SQ6 engine control unit, which will enable the team to use more sophisticated control systems. As well as improving the car's performance in the coming season, this will be the cornerstone for the team's advancements for years to come. 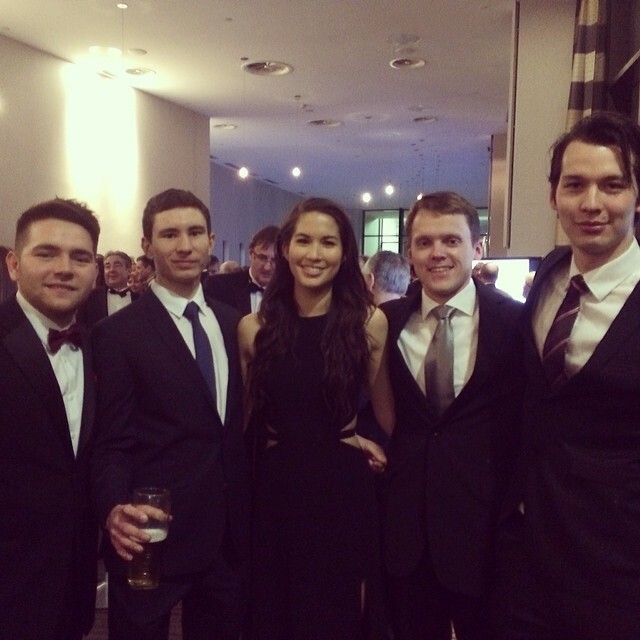 Team members of ULM were recently invited to the annual dinner hosted by the Institute of Engineering and Technology. 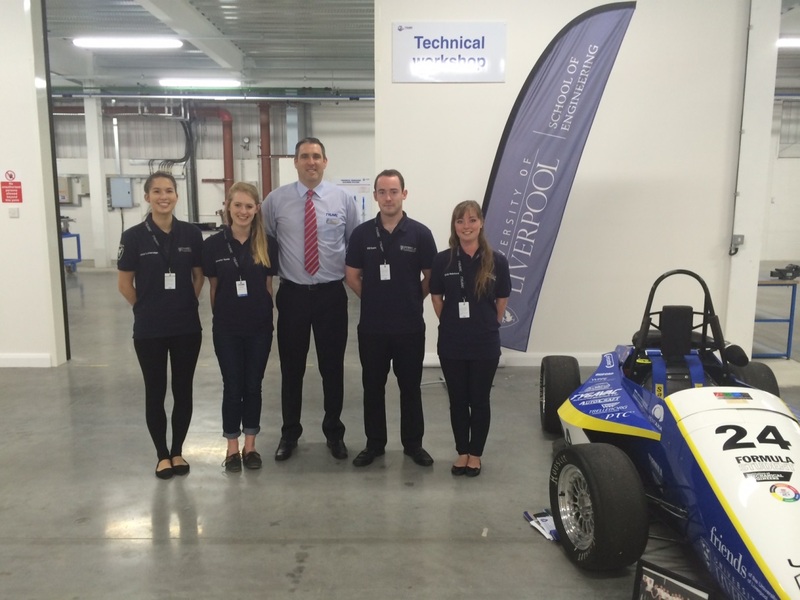 Tickets were provided, courtesy of Bilfinger Industrial and Automation Services, to give student engineers the opportunity to network and enjoy an evening at the Hilton, Liverpool. This also provided the platform for team members to socialise with sponsors, Virtalis and VEC. Huge thanks go to our sponsors Virtalis and the Virtual Engineering Centre (VEC) for hosting the ULM end of term Christmas event. 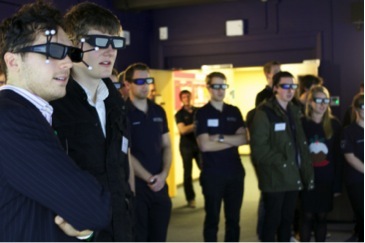 Their cutting edge virtual reality software and hardware facilities in Daresbury allowed visitors the chance to explore and interact with a CAD model of the car in immersive 3D. John Eldridge, a key stakeholder of the team presented an inspiring talk on his experiences as a professional engineer, and had a chance to speak with new and old team members attending the event. 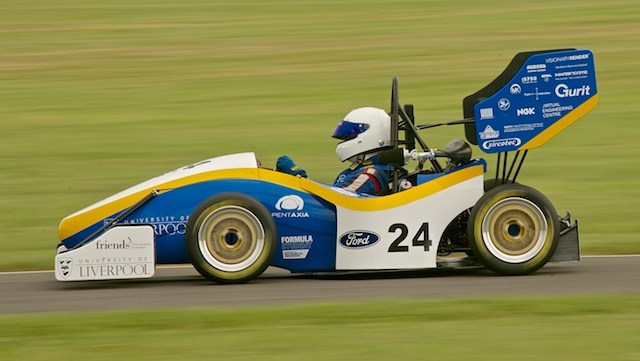 John offered his insight on the performance of British teams competing in Formula Student, and was optimistic of the future for young Engineers. ULM009 was then presented to sponsors and alumni, showing the progress being made on the new car. 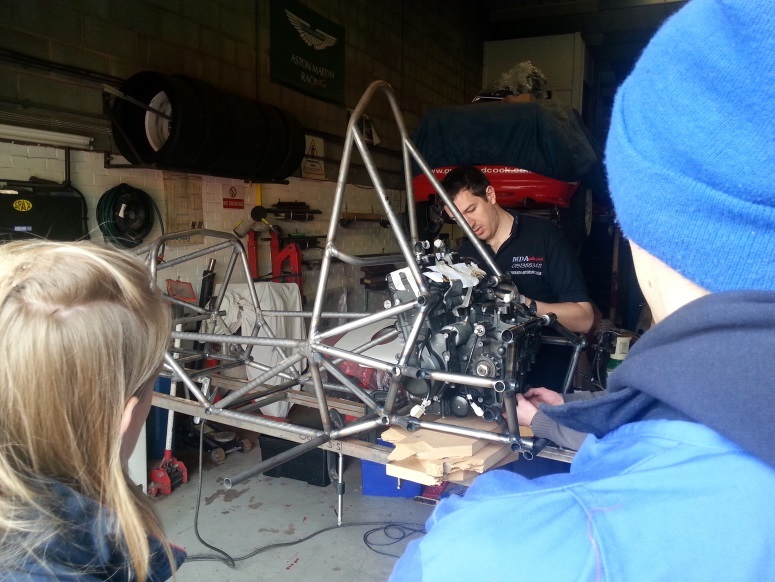 There was a lot of great feedback, with which the team can continue to develop in the lead-up to the 2014 Formula Student season. Thanks to everyone who attended, and to the VEC for providing such impressive facilities. 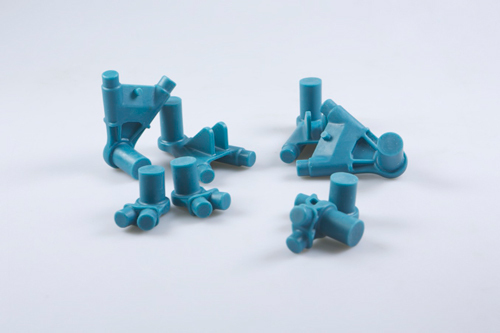 Renishaw have once again provided the team with the wax patterns to be used in the casting process at Tritech. We would like to thankboth of these companies for their continued support in the team! 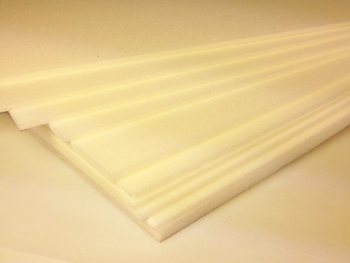 A big thanks to Severn Valley Sailplanes for their generous donation of RohaCell foam for reinforcing composite parts on our car this season. 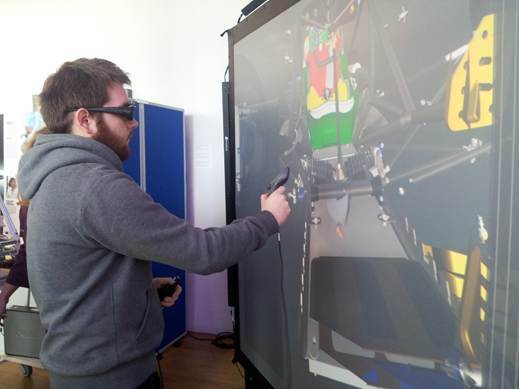 The team are thrilled to introduce Virtalis, a ground-breaking Virtual Reality software working closely with the University of Liverpool’s Virtual Engineering Centre. 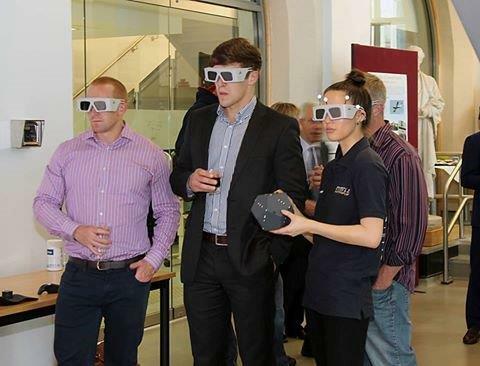 Virtalis software allows users to interact with their design in stereoscopic 3D space, creating an immersive experience for students and professionals alike. Manipulating CAD in virtual reality allows for a more in-depth view of the car, and a refreshing new method of design conceptualisation. The team is excited to present ULM009 at an event in the near future, and Virtalis allows this to be done like never before. 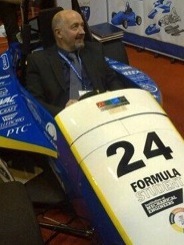 One of the biggest networking events in the UK, the Advanced Engineering Show was a huge success for the team. 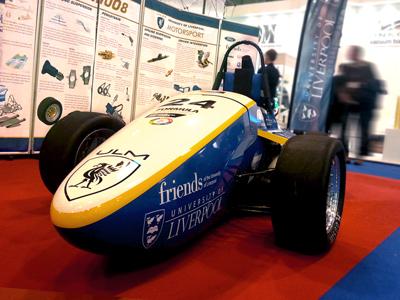 Presenting the car in the Networking Area of the Composites Show brought plenty of attention to the Formula Student project and the team. With over 580 companies on display; exhibitors, visitors and even other students were all intrigued about the project and the team was able to establish close links to companies throughout the UK. Having attended the event last year as a small group of visitors, the team was able to form partnerships with many composite specialists that are recurring exhibitors of the show. Some of whom had not previously had a chance to see the car, and Steve Doughty, from SHD Composites, even got a chance to sit in the car for the first time. Special thanks go to all of our sponsors that support us through such an amazing project every year and to the organisers of the Advanced Engineering Show that gave us the opportunity to present our car. Another year, another fight for pole position. 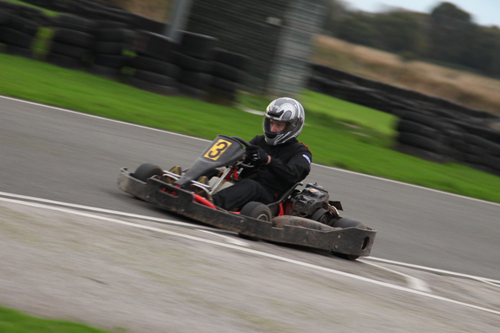 Keen drivers were invited to put their skill to the test as the whole team went to Hooton Park Karting Circuit for a day of racing. Each driver had two sets of 10 laps to show off their driving expertise and make a name for themselves as a potential Formula Student driver. 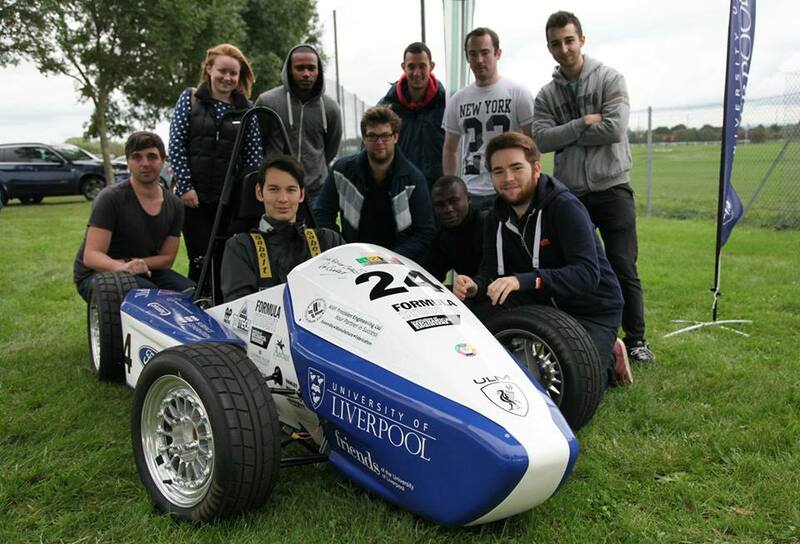 Once again, the team visited Aintree race course to present ULM008. The day was a great experience for 3rd years just joining the team to get a feel of events and showing off the car, and everyone had a good time. Senior members went to visit the team sponsor, Titan. 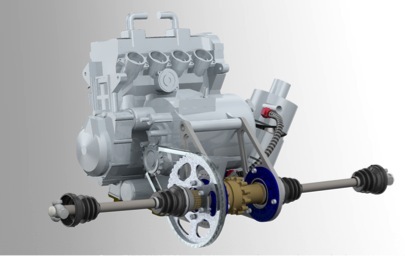 Titan were interested to take a look at the rack and pinion steering construction from last years car, and analyse its design. The performance of the steering column proved strong enough that a similar solution for this years car will be designed and manufactured by Titan themselves. New ideas were discussed for ULM009, and hopefully some advancements can be made in the future!